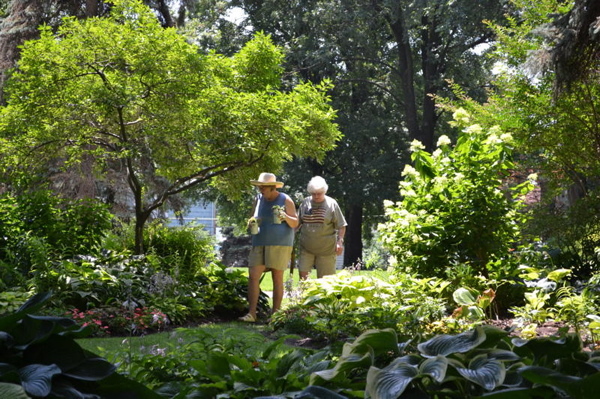 The St. Louis Horticultural Society was treated to a lovely visit at Hort members Pat and Jean’s garden, caretakers of a most beautiful and extraordinary garden, “a moment in time”. We were duly inspired and impressed! Their garden has just hit peak bloom season for daylillies and their collection of hostas, shade plants, as well as several varieties of ginger, toad lilies, and succulents are more than amazing! There are attractive stone paths that invite meandering and set off the multitude of plants beautifully. You can tell how much time and love they put into their yard, it’s absolutely stunning. Check out our photo section to see a small sample of the beauty there. After our casual tour of the garden we all sat and had a very relaxing visit in their elegant screened in porch. The conversation was great, the garden restful, and a good time was had by all. THANK YOU Pat and Jean for your hospitality and generosity inviting us to your home.